Jason Corona from San Dimas is one of the many people who wait in the long line while taking in the sweet smells and sights of the cult favorite The Donut Man on Route 66 in Glendora, California. The little shop’s window displays are perfectly lined with an assortment of puffy warm pastries, leaving customers with the impossible task of choosing between so many delicious treats. The patrons wait patiently for donuts that are out of the ordinary and always amazing—the seasons rotate with their favorites: fresh strawberry, peach, cream puff and pumpkin spice donuts. “I’ve been coming here 25 years, since I was a teenager. I’ve moved around many times but always find my way back here,” says Jason. 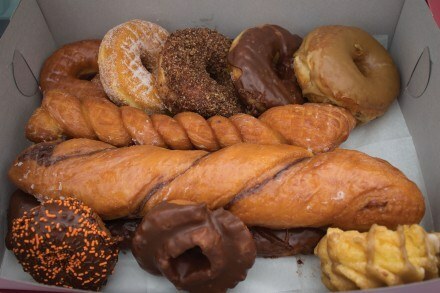 Indeed, this donut house gem has been on the go-to list for many since their teens. In fact, more than three generations of families have continued the pilgrimage, and the shop has served as a classic sweet-tooth favorite to customers near and far. Whether it is mid-afternoon on a Wednesday or midnight on a Saturday, Donut Man is to donut lovers what Tommy’s is to hamburger connoisseurs—one can satisfy that sweet craving at all hours. Jim Nakano and his wife Miyoko wanted to start, in Jim’s words, a “mom and pop” business that involved something they both loved. At the time, Jim was working retail at Macy’s. That’s when Miyoko’s sweet-tooth kicked in, and she reminded her husband she loved hot, fresh donuts. Jim answered his wife’s passion by opening up the shop. Like most small businesses, the Nakano’s did everything from baking to selling the delicious treats, working 16-hour days. Almost impossibly, the couple also vowed to keep the store open 24 hours. 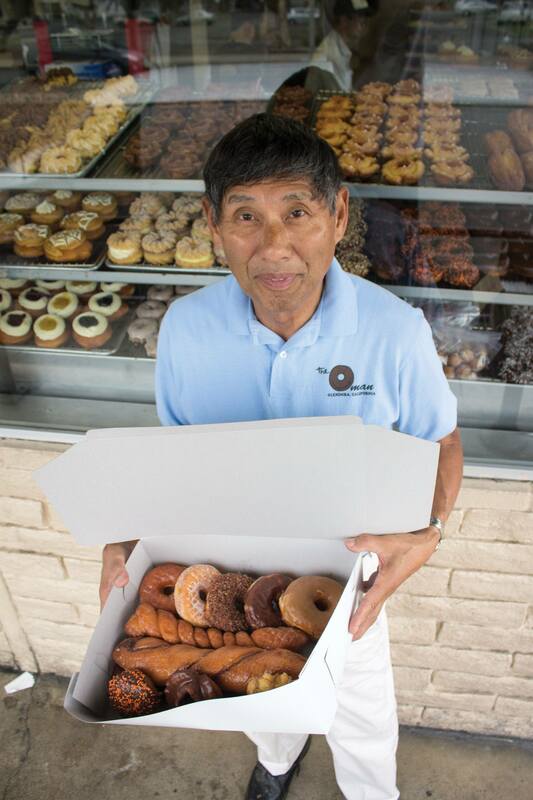 Soon, their hard work paid off; The Donut Man was able to distinguish itself from others, and customers became loyal. Patrons began visiting time and time again, some driving great distances. “About 70 percent of my customers are more than five miles away. It’s amazing to see people from different areas come to the shop time and time again,”says Jim. He is proud that his famous donuts have been featured in numerous food articles and on national television, including The Food Network and Cooking Channel. “There’s always a story on my shop; it makes me feel grateful that there’s always such a positive response,” says Jim. The Nakanos developed unique donuts that capture the seasons. Their fall pumpkin spice pastry ($1.70) is a mouthwatering donut filled with silky pumpkin spice custard and topped with rich cream cheese. The Donut Man’s decadent winter offering of a cream puff donut ($1.70), filled with a sweet cream cheese custard and sprinkled with a healthy dose of powdered sugar, makes a donut lover feel like she stepped into a winter wonderland. Once winter is over and spring has arrived, strawberry season is what every Donut Man customer delights in. The signature strawberry donut is the shop’s most famous and biggest hit. It begins with fresh strawberries from the Farmer’s Market in downtown Los Angeles. Once the red gems arrive in the shop, they rest in a sunny spot to ripen. The donut magic begins with the rolling of The Donut Man’s signature dough. 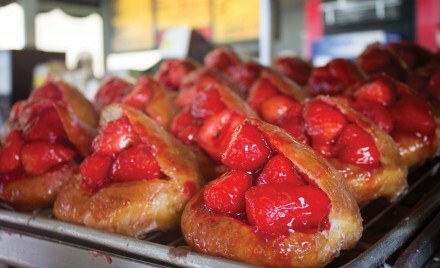 Straight from the oven, the donuts are stuffed with whole strawberries and topped with a strawberry drizzle. Peach lovers have their season too; the summer’s signature fruit arrives, and The Donut Man features them with grace. The peaches, also purchased at the Los Angeles Farmer’s Market, are ripened, then carefully peeled and placed into a golden glazed donut with a shiny syrup glaze. These peach fruit seasonal donuts, which take one to a donut lover’s paradise, only cost $4. The Donut Man’s famous Tiger Tail “Twist” ($1.50) is available all year long. This decadent dessert favorite is a foot-long glazed twist donut with sinful devil’s food chocolate inside, creating a fudgy-draped stripe through the middle. Customers might at first be intimidated by this ginormous donut, but many find themselves taking on the challenge and loving every bite. If one cannot decide, choose the “Donut Man Dozen Special” for $11. Pre-selected donuts are boxed and sold to the customer looking for a little adventure and devilishly good donut surprises. Whenever a sweet fix for the best donuts around is needed, one can bet The Donut Man is always the answer. The Donut Man, 915 E. Route 66, Glendora, California. 1. First and foremost, the strawberry donuts of course! 2. It is the perfect destination to satisfy your munchies after a long night out. 3. The donuts are made hot and fresh throughout the day; you never have to bite into a cold, soggy donut. 4. You’ll run into fellow L.A. sports fans waiting in line celebrating with a post game dessert. 5. The shop is open 24 hours, 7 days a week. All the donuts are extremely affordable—from 90 cents to $4. 6. You’ll meet some interesting characters since people drive from a distance and have been coming since it opened. 7. It’s a famous food destination that has been featured on the Cooking Channel and the Food Network’s “Road Show” with hosts Nikki, Stacey and Damaris. with a delicious donut; you can never go wrong. 10. If you’re looking for a donut shop that treats its customers like family, the Donut Man is the place for you. They focus on amazing customer service and build lasting relationships with their patrons.